It was Alex Ross (09/26/05) who called Rolando Villazon "Domingo's heir apparent in the Italian tenor repertory...." That's where I read it. Why would he want to curse him in this way? I went to the New Yorker website and printed out a few of Ross' columns so I could get a feeling for his writing, and right away I'm annoyed. Villazon is a real lyric tenor with a dark color. Domingo is a pushed up baritone. You leave my boy alone!! I liked very much the column (06/06/05) about the effect of recordings on classical music. This is a topic to be considered. Right away I start to think about musack. I'm sure there is a recording of every Baroque concerto ever written, all done in that lifeless, cookie-cutter style that is the essence of anti-music. His comments are good. He puts in a lot of facts. Read here how Singing Might Cause Obesity. It's the deep breathing. When I wrote that opera was about love, it was just an observation. I made a list from a few opera plot books and picked out the ones that form the basis for opera theater repertoire throughout the world. And there it was. They are all about love with not one single exception. With L'Amour de Loin ("Love from afar," Music by Kaija Saariaho and Libretto (in French) by Amin Maalouf) we have a new opera about love, and in its five years of existence it has already been presented in Salzburg, Santa Fe and Finland. The subject is longing, longing for someone else, for somewhere else, for an existence outside oneself. This is the opera for me. It is a dvd so I am not required to see it all at once as I would in the opera house. Jaufré Rudel, a troubadour living in a tower in Aquitaine has had many lovers and longs for love at a distance, for the far away, unattainable lover of ideals and dreams. He is sung by Gerald Finley, baritone. Clémence, countess of Tripoli, living in a tower in Lebanon, left Toulouse when she was five and has longed to return ever since. She is sung by Dawn Upshaw, soprano. The pilgrim longs to see the east, especially the holy land; sung by Monica Groop, mezzo-soprano. There is also a chorus who take on the character of Rudel’s friends, his dubious friends, and other characters in the drama. The chorus is also part of the orchestration, much as it would have been in the writing of Debussy. There are two harps, also like Debussy. All long for what they do not have. The pilgrim travels back and forth between them and is the cause of all that happens. Without the pilgrim they would sit in their towers alone and discontented. This production is simple. The towers are represented by metal winding staircases. The pilgrim’s boat is small and white in the center. The stage is covered with a thin layer of water in which the boat sails and the pilgrim walks. Rudel expresses his desire for a distant love, and he is overheard by the pilgrim, who relates a brief story about a woman in Tripoli that he saw one day. She was, “beautiful without the arrogance of beauty, noble without the arrogance of nobility, pious without the arrogance of piety." The hero is fatally fascinated and describes a complete imaginary woman. The camera shows briefly the orchestra pit, and it contains what appears to be a standard opera orchestra. Modern pits allow for the possibility of players sitting under the stage. kbd next to pf means it is an electronic keyboard, perhaps a synthesizer. All we see is strings, two harps and maybe some woodwinds on the other side. It could be a piece by Berlioz or Debussy they are about to play. The list above from G. Schirmer seems to have missed the harps. I am worrying about this because this ordinary, only somewhat large orchestra, these ordinary opera singers and the hidden chorus are making music with no obvious link to the music of Papa Haydn who first formalized the makeup of an orchestra. Once the ordinary looking conductor with his ordinary baton gives the downbeat, we don't see the orchestra any more. The singing is relatively ordinary, too, without too much irrational leaping about, a common feature of modern opera. There are even occasional trills and small ornaments such as an opera singer might do. There is throughout the work no apparent meter. Instruments, themes, melodies sneak mysteriously into the stream of sound, play for a while and just as mysteriously depart. It is a sea of sound rather more like the ocean than Haydn. Or perhaps more like the Mediterranean Sea where the action takes place. We come to opera for the ecstasy. Now I begin to fear that our hero who has stepped into the boat and is making his crossing to Tripoli will find at the other side that the love from afar is the only one that will sustain the ecstasy forever, that the reality of a real lover will pale beside it. What is opera without passion? Has the fear of annihilation any chance beside it? L'amour de loin is uncompromisingly modern and in spite of that may well be a masterpiece. Only its extreme difficulty would prevent it from becoming standard repertoire. The visual images in this dvd are haunting. Perhaps I will buy it after all. Somewhere in my reading I came across a sentence that said Rolando Villazon would be expected to step into Placido Domingo's shoes. He may feel free to step into the favorite son Mexican tenor shoes, but vocally they are quite different. Placido is a dramatic tenor as evidenced by his successful portrayal of Otello throughout his operatic career. Rolando is a lyric tenor, closer to Jose Carreras whose shoes he may feel free to step into. Don't be fooled by its dark color into thinking that his voice is heavier than it really is. Or even more important, let's hope he isn't fooled by this. It's a sad fact that I don't like his original Italian Opera arias cd as much as the French one. His "Una furtiva lagrima" is quite nice, but in general it seems he has the right amount of expressive freedom for French but not enough for Italian opera. This is a problem he can overcome. There are always articles on the internet about Cecilia Bartoli’s vocal technique. I even wrote a book about it. I have never believed she is a mezzo and said so. I wrote the things I wrote because I was worried and it provided an outlet. Cecilia’s technique is quite different from what other people are doing. I was concerned that she was pushing her voice down in order to perform contralto repertoire instead of letting her voice find its natural tessitura. When she said she would never sing the main Mozart heroines, that she was only recording them for fun, I said this was nonsense, that these were exactly the roles she should be singing. When she moved up into these areas, I was pleased. When I heard her Cleopatra in the spring, there was no hint that it was too high for her. She has the notes for Queen of the Night, but that certainly doesn’t provide a reason why she should sing her. I agree with the assessment that she is a lyric soprano with coloratura facility. That doesn’t make her Queen of the night. I have no sense that she needs to continue moving up. There are two things: technique and style. Most of the people saying this are wishing that she would perform the bel canto repertoire. I have to admit that her “bel raggio” recording is something I still find stunning. But people always say that Rossini composed his heroines for a mezzo. What they really mean is that Bellini and Donizetti extended the range and tessitura of the coloratura soprano upward from the range expected by Rossini. Instead Cecilia is moving in the opposite direction and singing music from the Baroque. Do I ever get the feeling that Cecilia would rather be singing bel canto? My writing came from concern, not from wishes and dreams. I don’t tell her what to do any more. It didn’t turn out to be any fun. The distinctiveness of her technique is part of the distinctiveness of her overall performance. And it is her distinctiveness that makes her stand out from the field and makes her the phenomenon she is. The other significant element of what makes Cecilia Cecilia is the fact that she can perform all kinds of music from her chosen period with so much vigor and excitement without any trace of corniness. She understands this music and brings her unique insight to it. Can we in our viewing from on high claim that she would understand bel canto this well? She is more and more immersed in the early early music movement with Harnancourt and Minkowski. Her technique determines her path. She would have to want a different path to want to change this, and I don’t see the signs. Her path also determines her technique. In Washington I had my first experience of the “Cecilia’s voice is tiny” phenomenon. I didn’t try to write about it. I was too shocked. Another relevant question: does the appearance of Anna Netrebko on the scene make this question moot? Anna does not hesitate or hang back. The New York Times panned Cecilia. 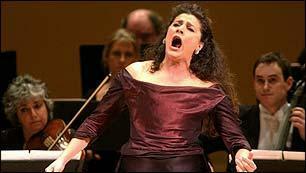 Some people do not get Cecilia Bartoli. I have a dear friend who falls into this category. She simply does not want to be confronted by all those facial expressions. 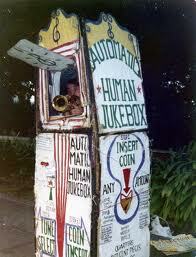 Another of my friends is patient not to offend my sensitivities, but prefers inward performers. Cecilia is outward, involving, expressive, intellectual and intuitive at the same time. Cecilia's career does not reflect the path of other performers. She is in our era the master of the recital / solo concert venue. She likes to have control, to make sure that the performance completely reflects her very highly developed conception. Still, I wouldn't fly to Europe to see her in a concert. I have only done that for my first love, opera. I have gone three times to Zurich (Cenerentola, Orfeo, Julius Caesar) to see her in opera, and found it always well worth the trip. But then I don't have to--she brings all her concert / recital programs here. I admit that for me she doesn't do enough opera. While they are digging up old music, could they please dig up a whole opera. I appear to be the only one who interpreted her movements as conducting. I thought she was moving her arms and shoulders to communicate with the musicians behind her. She sees herself in a certain way and guides her career to reflect this inner vision. She even manages her own career. Whatever she is doing, it is completely on purpose. The critic basically doesn't like the fact that he isn't watching Pelleas and Melisande. How can one respond logically to this? She isn't giving you what you want. She's giving you what she wants and relying on her persuasive gifts to bring you to her opinion. You open your heart and accept it, or you don't. This is not any singer's relationship to the public that I can recall. She creates an excitement around performing classical music that it desperately needs right now. She is altering our perceptions. This video of Glinka’s Ruslan and Lyudmila is a joy. In an interview with Valery Gergiev at the end I learned that Anna Netrebko was a mere 23 at the time, infancy in singer’s years. She was chosen for her voice, for her youth and for her beauty. I learned also that the production was a reproduction of a production from 1892. I particularly like the way this looks—very much like a fairy tale. I saw this live in San Francisco in 1995, also with Valery Gergiev and Anna Netrebko, and with the same production. We were thrilled and loved Anna instantly.